Over the weekend I had time to talk to friends about politics in our community and the importance of policy positions and decisions. We touched on all kinds of issues from local to Federal, but it got me to thinking about a critical element that is often missing. Where you’re coming from and how that impacts your ability to govern. See, anyone can copy and paste policy ideas from a think tank in Washington DC or Nashville. It doesn’t take much more than money to hire consultants to tell you what’s resonating with people in your target demo. But the one critical thing that no policy position tells you is where the candidate or elected official is coming from. At the top of this page is an image with the words “Make Shelby County Stronger”. I didn’t choose this because I think Shelby County is weak. Actually, compared to a lot of places we’re doing pretty well. I chose this because of my personal philosophy about what strength really is. Some people see strength as big, inflexible and unmoving. While that may represent a certain kind of strength, its not sustainable. We all have moments of weakness. We all bend from time to time. The problem with being inflexible is sometimes you stop whatever it is you’re against. But sometimes it breaks you leaving devastating consequences. That’s not the kind of strength I’m talking about. For me, strength is not just physical, but a spiritual, emotional, and intellectual state of being that guides you. It is a series of beliefs grounded in gospels of the New Testament and the teachings of my family: Love people. Help people. Listen to people. Be understanding. Be an example. It sounds simple but if you think about it, its a pretty tall order. Even though I’m not always as successful at this as I would like to be, these ideas frame both who I am, and why I decided to embark on this journey called candidacy. We have a lot of people in need in this community. Many of those needs go ignored or worse, are only being addressed at token levels. I believe this is a structural weakness that we have a moral obligation to correct. That doesn’t mean handouts. Everyone understands that giving a fish only feeds you for a day. We have to do more to teach people to fish. Teaching to fish is far less expensive and ensures that the knowledge will spread, which helps all of us succeed. Success isn’t a finite commodity and it cant survive in a vacuum. Success builds positive possibilities. True success demands to be shared. Sharing successes means more possibilities and more success throughout the community. The moment you decide to keep your success to yourself or deny your role in helping someone else succeed is the moment you extinguish a whole host of possibilities. It is a harm to yourself and your community that may seem silent, but has broad ranging effects. There’s an old saying that goes, “Success has many fathers, failure is an orphan”. The truth is, the responsibility for both success and failure are shared throughout our community. We like to think that if we mind our own business we’re somehow immune, but we’re not. We can’t be. We engage in our community every day, and in doing so, share responsibility for everything that goes on. And so it is from that point of view that I look at issues, especially the more vexing ones we face. With all that in mind, I offer a video from TEDxAustin. The speaker is a Death Penalty attorney who is discussing intervention ideas to keep people out of the criminal justice system, but the interventions he is discussing could be about any topic from education to teen pregnancy. For much of human history we’ve decided to intervene at the point of no return for the safety of society. As the speaker notes, this is much more expensive than earlier interventions. It also means the human capital that we’ve invested in through education and other spending brings a lower rate of return than it would if we focused on prevention than punishment. Several days ago I was at a meeting where one of the speakers said (and I’m paraphrasing) “Don’t do what’s right for the community, do what’s right for yourself.” I understand the rationale behind this thought process, but it makes me sad that people feel they are so disconnected from each other that their individual liberty is separate from society. Society is what protects individual liberty. Without it, we would all still be living in caves. I believe we have a duty, to ourselves and our society to focus on building successes at all levels. That means recognizing that we are all connected, whether we like it or not. That’s what society is. Through that connection, we flourish through our successes and suffer through our failures together, even if we don’t immediately see it. So making Shelby County stronger means rallying around the idea that we have to do more to address the issues we’re facing as a community rather than looking at someone else and saying, “Pick yourself up by your bootstraps”. Even the characters in the old Horatio Alger stories had help in building their success. Why is it any different now? So, if we want to reduce crime and teen pregnancy, increase educational attainment, and make our community a place people not only like to live, but want to live, we have to seek policies that help people succeed rather than focusing solely on punishing them when they fail. Building success is building strength. Building strength through early intervention comes at a much lower cost, both financially and in human capital, than after tragedy has struck. Sure, we’ll always have people that do wrong to others or themselves, but we can have far fewer if we choose to focus on stopping it before it starts. That’s the way to build a strong Shelby County. As we embark on the New Year, our community has a great number of opportunities and challenges ahead. While the economy appears to be on the way to a slow but steady recovery, unemployment in Shelby Co. still stands at just over 10%. Creating an environment that encourages expansion of existing businesses, attracts investment from companies that currently have no footprint in the County, and fosters the innovation that comes with new businesses is critical to the long-term success of our community. Recent successes in bringing in businesses like Electrolux and Mitsubishi are victories for the local economy, but we have to do more to support the businesses who have long-term investments in our community to help them grow and thrive. Crime is not the only area that impacts the our neighborhoods. Other issues such as abandoned and blighted properties also have a negative impact on the places we live. 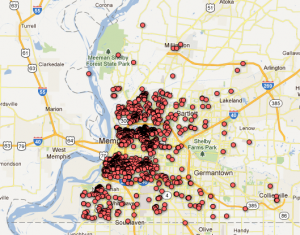 The 2010 census reports over 47,000 vacant housing units in Shelby County (11.9% vacancy). This is .5% higher than the national average, .6% higher than the state average and 1.5% higher than metro areas of equivalent size. In August, MSNBC reported that the Memphis MSA was the 3rd sickest housing market in the US. More than 50% of those units (24,000) are vacant rental properties, 28% (13,000) are vacant for “other reasons” and just under 13% (6100) were reported on the market for sale. The Shelby County Land Bank owns over 3600 properties in the County, many of which are in a state of disrepair. While the circumstances under which the County came to own these properties are varied, one thing is certainly true: vacant and blighted properties are safe harbors for criminal activity, a negative drag on property values in our neighborhoods, and bring zero revenue into the county in their current state. With such a high surplus of vacant residential units and stagnant population growth over the past decade (just 3.36%) County government should carefully consider the overall impact of new developments on virgin land that further stretches our infrastructure in favor of working to re-develop land currently on the grid. Focusing on re-development will increase the quality of life for thousands of Shelby Countians, bring jobs to the core of the community, and help reduce crime associated with vacancy and blight. 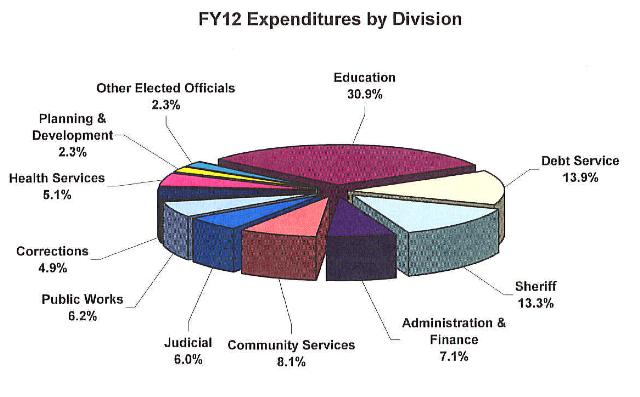 In the coming weeks the County Administration will introduce their budget for the next fiscal year. Based on the speed of the economic recovery and stagnant population growth over the past 10 years this will be a difficult process that is fraught with hard choices. As the County government prepares for this process, the administration should seek to provide additional data regarding the realities the County faces going forward. 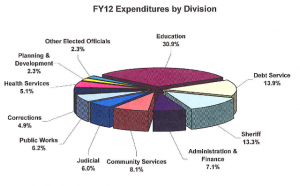 Simply putting a budget agenda together absent a fair and accurate reporting of the impact of those initiatives does nothing to better inform Commissioners nor the public at large of the long-term challenges faced by County government. In order to be a truly accountable actor, the County Government should work to compile and release data regarding the performance targets and impact of outcomes for each of its departments. For too long local government has been allowed to move forward without properly justifying its actions. This trend must stop. This is particularly true of County Debt, which stands at $1.6b (total debt for the state of Tennessee is just $1.7b) and consumes 14% of the County budget annually (second only to Education at 30.9%). A full, fair, and accurate accounting of county debt is necessary to ensure the public understands where past growth initiatives have been focused, what that debt is paying for, and ways to reduce the overall impact of debt to ensure our tax dollars bring the most value to all of us. While there are many issues that fall outside the direct control of local government, there is plenty that can be done at the local level to strengthen our community and foster an environment of growth and prosperity. In order to accomplish this, we must set aside some of our long-held assumptions and focus on the things that unite us rather than our differences. We are all Shelby Countians. We don’t have to view things as a zero-sum game. The truth is, that zero-sum worldview leaves us all fighting over crumbs while ignoring the cake that’s right in front of us. This fighting over crumbs has been, for far too long, a feature of local government, and it must stop. Because the New Year is about new beginnings and new ideas, we should take some time to consider where we see our community in the future. Last October at my personal blog I wrote about 10 Things to Make Memphis Stronger. These ideas apply not only to Memphis, but Shelby County as a whole. The broad principles outlined in this post guide my vision for the future of Shelby County. In order to receive effective, responsive and accountable government, we must first demand it. I hope you will stand up and demand it with me. Thank you for your time, and Happy New Year.